Hat tip to Rothman for this. I don’t know if Stiennon is off his meds or simply needed to re-post something from 2001 to meet an editorial quota, but his Network World article titled "The Most Important Networking Trend of 2008" ties thus far with the "Evolution of Dance" as my vote for most entertaining Internet content. The Wall Street Journal issued "… the year’s most important article on networking" in an article titled "New Routers Catch the Eyes of IT Departments" which validates the heretofore undiscovered trend of convergence and commoditization! "Real" network security players such as Cisco, Juniper and Redback are building solutions to this incredible new trend and because of the badge on the box, will be considered ready for "…enterprise prime time." The WSJ article talks about the Cisco ASR1000 router as the penultimate representation of this new breed of converged "network security" device. Oh, crap! Somebody better tell Cisco! So despite the fact that Cisco ASR1000 is positioned as an edge device as are these crazy solutions called UTM devices, it seems we’re all missing something because somehow a converged edge device now counts as being able to provide a "secure network fabric?" major shifts in markets and technology? Were I in the UTM business, I’d be engaging the reality distortion field and speed-dialing my patent attorneys at this point. Fortinet has recently had some very interesting patent applications granted by the PTO. U.S. Patent # 7,389,358 – Distributed Virtual System to Support Managed, Network-based Services – directed to a virtual routing system, which includes processing elements to manage and optimize IP traffic, useful for service provider switching functions at Internet point-of-presence (POP) locations. These patents could have some potentially profound impact on vendors who offer "integrated security" by allowing for virtualized application of network security policy. These patents could easily be enforced outside of the typically-defined UTM offerings, also. I’m quite certain Cisco and Juniper are taking note as should be anyone in the business of offering virtualized routing/switching combined with security — that’s certainly a broad swath, eh? On a wider note, I’ve actually been quite impressed with the IP portfolio that Fortinet has been assembling over the last couple of years. If you’ve been paying attention, you will notice (for example) that that they have scooped up much of the remaining CoSine IP as well as recently acquired IPlocks’ database security portfolio. I trust you can figure out why…why not hazard a guess in the comments? How about those ASA’s or FWSMs? How about those load balancers with VIPs? Now, I’m not a lawyer, I just play one on teh Interwebs. Profiling Data At the Network-Layer and Controlling It’s Movement Is a Bad Thing? I’ve been watching what appears like a car crash in slow-motion and for some strange reason I share some affinity and/or responsibility for what is unfolding in the debate between Rory and Rob. That’s fine and I agree. The concept of ADAPT is completely transparent to "users." This doesn’t obviate the fact that someone will have to be responsible for characterizing what is important and relevant to the business in terms of "assets/data," attaching weight/value to them, and setting some policies regarding how to mitigate impact and ultimately risk. So I think you’re still missing my point. The example I gave of the X-Series using ADAPT takes a combination of best-of-breed security software components such as FW, IDP, WAF, XML, AV, etc. and provides you with segregation as you describe. HOWEVER, the (r)evolutionary delta here is that the ADAPT profiling of content set by policies which are invisible to the user at the network layer allows one to make security decisions on content in context and control how data moves. the right tags and controlling it’s flow that bugs me. …and thus it’s obvious that I completely and utterly disagree with this statement. Without tying some sort of identity (pseudonymity) to the user/machine AND combining it with identifying the channels (applications) and the content (payload) you simply cannot make an informed decision as to the legitimacy of the movement/delivery of this data. I used the case of being able to utilize client-side tagging as an extension to ADAPT, NOT as a dependency. Go back and re-read the post; it’s a network-based transparent tagging process that attaches the tag to the traffic as it moves around the network. I don’t understand why that would bug you? Please explain this to me? What standards need to exist in order to tag data — unless of course you’re talking about the heterogeneous exchange and integration of tagging data at the client side across platforms? Not so if you do it at the network layer WITHIN the context of the architecture I outlined; the clients, switches, routers, etc. don’t need to know a thing about the process as it’s done transparently. I wasn’t arguing that this is the end-all-be-all of data-centric security, but it’s worth exploring without deadweighting it to the negative baggage of DRM and the existing DLP/Extrusion Prevention technologies and methodologies that currently exist. ADAPT is doable and real; stay tuned. Now that I’ve annoyed you by suggesting that network security will over time become irrelevant given lost visibility due to advances in OS protocol transport and operation, allow me to give you another nudge towards the edge and further reinforce my theories with some additionally practical data-centric security perspectives. If any form of network-centric security solution is to succeed in adding value over time, the mechanics of applying policy and effecting disposition on flows as they traverse the network must be made on content in context. That means we must get to a point where we can make “security” decisions based upon information and its “value” and classification as it moves about. It’s not good enough to only make decisions on how flows/data should be characterized and acted on with the criteria being focused on the 5-tupule (header,) signature-driven profiling or even behavioral analysis that doesn’t characterize the content in context of where it’s coming from, where it’s going and who (machine, virtual machine and “user”) or what (application, service) intends to access and consume it. In the best of worlds, we like to be able to classify data before it makes its way though the IP stack and enters the network and use this metadata as an attached descriptor of the ‘type’ of content that this data represents. We could do this as the data is created by applications (thick or thin, rich or basic) either using the application itself or by using an agent (client-side) that profiles the data prior to storage or transmission. of an email before you can hit the send button or even the document info that can be created when one authors a Word document. There are a bunch of ERM/DRM solutions in play today that are bandied about being sold as “compliance” solutions, but there value goes much deeper than that. IP Leakage/Extrusion prevention systems (with or without client-side tie-ins) try to do similar things also. Ideally, this metadata would be used as a fixed descriptor of the content that permanently attaches itself and follows that content around so it can be used to decide what content should be “routed” based upon policy. If we’re not able to use this file-oriented static metadata, we’d like then for the “network” (or something in/on it) to be able to dynamically profile content at wirespeed and characterize the data as it moves around the network from origin to destination in the same way. So, this is where Applied Data & Application Policy Tagging (ADAPT) comes in. ADAPT is an approach that can make use of existing and new technology to profile and characterize content (by using content matching, signatures, regular expressions and behavioral analysis in hardware or software) to then apply policy-driven information “routing” functionality as flows traverse the network by using an 802.1 q-in-q VLAN tags (open approach) or applying a proprietary ADAPT tag-header as a descriptor to each flow as it moves around the network. The ADAPT tag/VLAN is user defined and can use any taxonomy that best suits the types of content that is interesting; one might use asset classification such as “confidential” or uses taxonomies such as “HIPAA” or “PCI” to describe what is contained in the flows. One could combine and/or stack the tags, too. The tag maps to one of these arbitrary categories which could be fed by interpreting metadata attached to the data itself (if in file form) or dynamically by on-the-fly profiling at the network level. As data moves across the network and across what we call boundaries (zones) of trust, the policy tags are parsed and disposition effected based upon the language governing the rules. If you use the “open” version using the q-in-q VLAN’s, you have something on the order of 4096 VLAN IDs to choose from…more than enough to accomodate most asset classification and still leave room for VLAN usage. Enforcing the ACL’s can be done by pretty much ANY modern switch that supports q-in-q, very quickly. Just like an ACL for IP addresses or VLAN policies, ADAPT does the same thing for content routing, but using VLAN ID’s (or the proprietary ADAPT header) to enforce it. To enable this sort of functionality, either every switch/router in the network would need to either be q-in-q capable (which is most switches these days) or ADAPT enabled (which would be difficult since you’d need every network vendor to support the protocols.) You could use an overlay UTM security services switch sitting on top of the network plumbing through which all traffic moving from one zone to another would be subject to the ADAPT policy since each flow has to go through said device. Since the only device that needs to be ADAPT aware is this UTM security service switch (see the example below,) you can let the network do what it does best and utilize this solution to enforce the policy for you across these boundary transitions. Said UTM security service switch needs to have an extremely high-speed content security engine that is able to characterize the data at wirespeed and add a tag to the frame as it moves through the switching fabric and processed prior to popping out onto the network. Clearly this switch would have to have coverage across every network segment. It wouldn’t work well in virtualized server environments or any topology where zoned traffic is not subject to transit through the UTM switch. Take the example below where the X80 is connected to the layer-3 switches using 802.1q VLAN trunked interfaces. I’ve made this an intentionally simple network using VLANs and L3 routing; you could envision a much more complex segmentation and routing environment, obviously. Each of the clients/servers in the respective VLANs default routes out to an IP address which belongs to the firewall cluster IP addresses which is proffered by the firewall application modules providing service in the X80. Using solely IP addresses and/or L2 VLANs, let’s say the firewall and IPS policies allow this behavior as the clients in that VLAN have a legitimate need to access the HR Intranet server. However, let’s say that this user tries to access data that exists on the HR Intranet server but contains personally identifiable information that falls under the governance/compliance mandates of HIPAA. This could be done by reading the metadata if it exists as an attachment to the content’s file structure, in cooperation with an extrusion prevention application running in the chassis, or in the case of ad-hoc web-based applications/services, done dynamically. According to the ADAPT policy above, this data would then be either silently dropped, depending upon what “deny” means, or perhaps the user would be redirected to a webpage that informs them of a policy violation. Rule 2 above would allow authorized IP’s in VLANs to access PCI-classified data. You can imagine how one could integrate IAM and extend the policies to include pseudonymity/identity as a function of access, also. Or, one could profile the requesting application (browser, for example) to define whether or not this is an authorized application. You could extend the actions to lots of stuff, too. In fact, I alluded to it in the first paragraph, but if we back up a step and look at where consolidation of functions/services are being driven with virtualization, one could also use the principles of ADAPT to extend the ACL functionality that exists in switching environments to control/segment/zone access to/from virtual machines (VMs) of different asset/data/classification/security zones. What this translates to is a workflow/policy instantiation that would use the same logic to prevent VM1 from communicating with VM2 if there was a “zone” mis-match; as we add data classification in context, you could have various levels of granularity that defines access based not only on VM but VM and data trafficked by them. Furthermore, assuming this service was deployed internally and you could establish a trusted CA with certs that would support transparent MITM SSL decrypts, you could do this (with appropriate scale) with encrypted traffic also. This is data-centric security that uses the network when needed, the host when it can and the notion of both static and dynamic network-borne data classification to enforce policy in real-time. Interop has has been great thus far. One of the most visible themes of this year’s show is (not suprisingly) the hyped emergence of 10Gb/s Ethernet. 10G isn’t new, but the market is now ripe with products supporting it: routers, switches, servers and, of course, security kit. With this uptick in connectivity as well as the corresponding float in compute power thanks to Mr. Moore AND some nifty evolution of very fast, low latency, reasonably accurate deep packet inspection (including behavioral technology,) the marketing wars have begun on who has the biggest, baddest toys on the block. Whenever this discussion arises, without question the notion of "carrier class" gets bandied about in order to essentially qualify a product as being able to withstand enormous amounts of traffic load without imposing latency. One of the most compelling reasons for these big pieces of iron (which are ultimately a means to an end to run software, afterall) is the service provider/carrier/mobile operator market which certainly has its fair share of challenges in terms of not only scale and performance but also security. I blogged a couple of weeks ago regarding the resurgence of what can be described as "clean pipes" wherein a service provider applies some technology that gets rid of the big lumps upstream of the customer premises in order to deliver more sanitary network transport. What’s interesting about clean pipes is that much of what security providers talk about today is only actually a small amount of what is actually needed. Security providers, most notably IPS vendors, anchor the entire strategy of clean pipes around "threat protection" that appears somewhat one dimensional. This normally means getting rid of what is generically referred to today as "malware," arresting worm propagation and quashing DoS/DDoS attacks. It doesn’t speak at all to the need for things that aren’t purely "security" in nature such as parental controls (URL filtering,) anti-spam, P2P, etc. It appears that in the strictest definition, these aren’t threats? The trumpets sounded and the heavens parted as these products were announced touting threat protection via IPS at levels supposedly never approached before. More appliances. Lots of interfaces. Big numbers. Yet to be seen in action. Also, to be clear a 2U rackmount appliance that is not DC powered and non-NEBS certified isn’t normally called "Carrier-Class." I find these announcements interesting because even with our existing products (which run ISS and Sourcefire’s IDS/IPS software, by the way) we can deliver 8Gb/s of firewall and IPS today and have been able to for some time. our products and positioning. One super-critical difference is that along with high throughput and low latency you get to actually CHOOSE which IPS you want to run — ISS, Sourcefire and shortly Check Point’s IPS-1. You can then combine that with firewall, AV, AS, URL filtering, web app. and database firewalls and XML security gateways in the same chassis to name a few other functions — all best of breed from top-tier players — and this is what we call Enterprise and Provider-Class UTM folks. Holistically approaching threat management across the entire spectrum is really important along with the speeds and feeds and we’ve all seen what happens when more and more functionality is added to the feature stack — you turn a feature on and you pay for it performance-wise somewhere else. It’s robbing Peter to pay Paul. The processing requirements necessary at 10G line rates to do IPS is different when you add AV to the mix. The next steps will be interesting and we’ll have to see how the switch and overlay vendors rev up to make their move to have the biggest on the block. Hey, what ever did happen to that 3Com M160? Jeff Bardin over on the CSO blog pitched an interesting stake in the ground when he posited "Connectivity As A Utility: Where are My Clean Pipes?" Specifically, Jeff expects that his (corporate?) Internet service functions in the same manner as his telephone service via something similar to a "do not call list." Basically, he opts out by placing himself on the no-call list and telemarketers cease to call. Others might liken it to turning on a tap and getting clean, potable water; you pay for a utility and expect it to be usable. All of it. I think that most people would agree with the concept of clean pipes in principle. I can’t think of any other utility where the service levels delivered are taken with such a lackadaisical best effort approach and where the consumer can almost always expect that some amount (if not the majority) of the utility is unusable. Over the last year, I’ve met with many of the largest ISP’s, MSSP’s, TelCo’s and Mobile Operators on the planet and all are in some phase of deploying some sort of clean pipes variant. Gartner even predicts a large amount of security to move "into the cloud." In terms of adoption, EMEA is leaps and bounds ahead of the US and APAC in these sorts of services and will continue to be. The relative oligopolies associated with smaller nation states allows for much more agile and flexible service definition and roll-outs — no less complex, mind you. It’s incredible to see just how disparate and divergent the gap is between what consumers (SME/SMB/Mobile as well as large enterprise) are offered in EMEA as opposed to the good-ol’ U S of A. However, the stark reality is that the implementation of clean pipes by your service provider(s) comes down to a balance of two issues: efficacy and economics, with each varying dramatically with the market being served; the large enterprise’s expectations and requirements look very, very different from the SME/SMB. Let’s take a look at both of these elements. If you ask most service providers about so-called clean pipes up to a year ago, you could expect to get an answer that was based upon a "selfish" initiative aimed at stopping wasteful bandwidth usage upstream in the service provider’s network, not really protecting the consumer. What is interesting about these services is that they basically define the same functions you can now get in those small little UTM boxes that consolidate security functionality at the "perimeter." The capital cost of these devices and the operational levies associated with their upkeep are pretty close in the SME/SMB and when you balance what you get in "good enough" services for this market as well as the overall availability of these "in the cloud" offerings, UTM makes more sense for many in the near term. For the large enterprise, the story is different. Outsourcing some level of security to an MSSP (or perhaps even the entire operation) or moving some amount upstream is a matter of core competence and leveraging the focus of having internal teams focus on the things that matter most while the low hanging fruit can be filtered out and monitored by someone else. I describe that as filtering out the lumps. Some enormous companies have outsourced not only their security functions but their entire IT operations and data center assets in this manner. It’s not pretty, but it works. I’m not sure they are any more secure than they were before, however. The risk simply was transferred whilst the tolerance/appetite for it didn’t change at all. Puzzling. Is it really wrong to think that companies (you’ll notice I said companies, not "people" in the general sense) should pay for clean pipes? I don’t think it is. The reality is that for non-commercial subscribers such as home users, broadband or mobile users, some amount of bandwidth hygiene should be free — the potable water approach. I think, however, that should a company which expects elevated service levels and commensurate guarantees of such, want more secure connectivity, they can expect to ante up. Why? Because the investment required to deliver this sort of service costs a LOT of money — both to spin up and to instantiate over time. You’re going to have to pay for that somewhere. Again, even though Jeff’s organization isn’t small by any means, the stuff he’s complaining about here is really the low-hanging fruit. It doesn’t bear a dent against the targeted, malicious and financially-impacting security threats that really demands a level of service no service provider will be able to deliver without a huge cost premium. strategic alliances at McAfee, in Santa Clara, Calif.
and mobile device security, Sonecha said. Look at all those services! What have they delivered as a service in the cloud or clean pipes? Nada. The chassis-based products which were to deliver these services never materialized and neither did the services. Why? Because it’s really damned hard to do correctly. Just ask Inkra, Nexi, CoSine, etc. Or you can ask me. The difference is, we’re still in business and they’re not. It’s interesting to note that every one of those "consortium members" with the exception of Cable and Wireless are Crossbeam customers. Go figure. Once the provider starts filtering at the ingress/egress, one must trust that the things being filtered won’t have an impact on performance — or confidentiality, integrity and availability. Truth be told, as simple as it seems, it’s not just about raw bandwidth. Service levels must be maintained and the moment something that is expected doesn’t make its way down the pipe, someone will be screaming bloody murder for "slightly clean" pipes. Ask me how I know. I’ve lived through inconsistent application of policies, non-logged protocol filtering, dropped traffic and asymmetric issues introduced by on-prem and in-the-cloud MSSP offerings. Once the filtering moves past your prem. as a customer, your visibility does too. Those fancy dashboards don’t do a damned bit of good, either. Ever consider the forensic impact? The problem is that most of these solutions are disparate point products run by different business units at different parts of the network. Most are still aimed at the perimeter service — it’s just that the perimeter has moved outward a notch in the belt. From the large enterprise I’d say that if you are going to expect that operational service levels will be met, think again. What happens when you introduce web services, SOA and heavy XML onto externally-exposed network stubs. What happens when Web2/3/4.x technologies demand more and more security layers deployed alongside the mechanics and messaging of the service? You can expect issues and the lack of transparency will be an issue on all but the most simple of issues. Think your third party due diligence requirements are heady now? Wait until this little transference of risk gets analyzed when something bad happens — and it will. Oh how quickly the pendulum will swing back to managing this stuff in-house again. 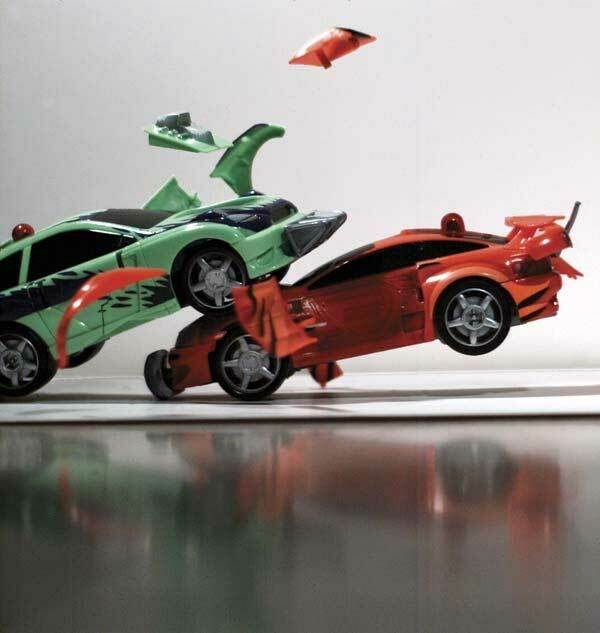 This model doesn’t scale and it doesn’t address the underlying deficiencies in the most critical elements of the chain: applications, databases and end-point threats such as co-opted clients as unwilling botnet participants. But to Jeff’s point, if he didn’t have to spend money on the small stuff above, he could probably spend it elsewhere where he needs it most. I think services in the cloud/clean pipes makes a lot of sense. I’d sure as hell like to invest less in commoditizing functions at the perimeter and on my desktop. I’m just not sure we’re going to get there anytime soon. concern for the enterprise, highlighting decision criteria and context for each domain. actions toward improving enterprise security. 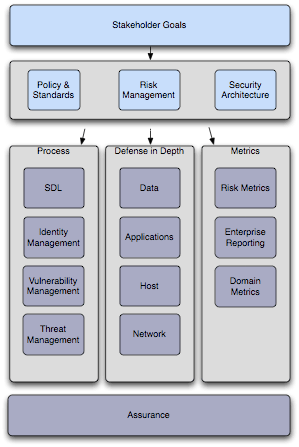 I appreciated the graphical representation of the security architecture blueprint as it provides some striking parallels to the diagram that I created about a year ago to demonstrate a similar concept that I call the Unified Risk Management (URM) framework. Managing risk is fast becoming a lost art. As the pace of technology’s evolution and adoption overtakes our ability to assess and manage its impact on the business, the overrun has created massive governance and operational gaps resulting in exposure and misalignment. This has caused organizations to lose focus on the things that matter most: the survivability and ultimate growth of the business. Overwhelmed with the escalation of increasingly complex threats, the alarming ubiquity of vulnerable systems and the constant onslaught of rapidly evolving exploits, security practitioners are ultimately forced to choose between the unending grind of tactical practices focused on deploying and managing security infrastructure versus the strategic art of managing and institutionalizing risk-driven architecture as a business process. URM illustrates the gap between pure technology-focused information security infrastructure and business-driven, risk-focused information survivability architectures and show how this gap is bridged using sound risk management practices in conjunction with best of breed consolidated Unified Threat Management (UTM) solutions as the technology anchor tenant in a consolidated risk management model. URM demonstrates how governance organizations, business stakeholders, network and security teams can harmonize their efforts to produce a true business protection and enablement strategy utilizing best of breed consolidated UTM solutions as a core component to effectively arrive at managing risk and delivering security as an on-demand service layer at the speed of business. This is a process we call Unified Risk Management or URM. The point of URM is to provide a holistic framework against which one may measure and effectively manage risk. Each one of the blocks above has a set of sub-components that breaks out the specifics of each section. Further, my thinking on URM became the foundation of my exploration of the Security Services Oriented Architecture (SSOA) model. You might also want to check out Skybox Security’s Security Risk Management (SRM) Blueprint, also. Thanks again to Gunnar as I see some gaps that I have to think about based upon what I read in his SAB document.